How many times have you read somewhere or heard someone state the “S&P 500 is up or down X% today?” Or have you heard someone say that they own a mutual fund or ETF mirrors the S&P 500? Lastly, have you read one of our stock analyses where we compare a company’s price to the S&P 500 to determine if the company is undervalued? If you are a beginning investor, when asking those or similar questions to yourself, did you even stop and wonder what exactly the S&P 500 is? This year, we have started our financial education series where we educate investors of all experience levels about various topics. We’ve covered topics such as Who and What Is Vanguard?, What is the Dividend Payout Ratio?, and What is a Dividend? 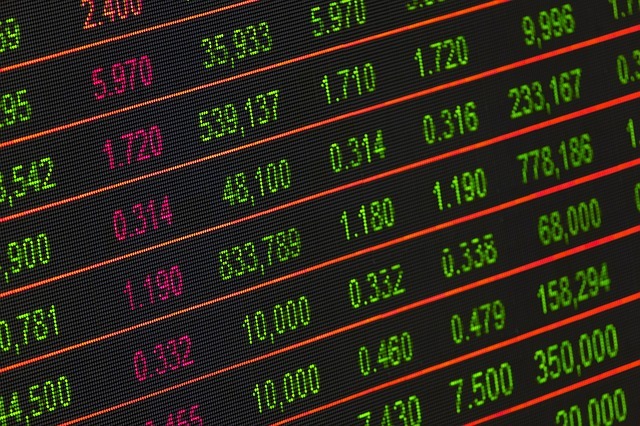 In this article, we will take a deeper dive into the S&P 500, explain what the stock market index is, provide a background, and review how the S&P 500 determines which stocks are included in the index. Let’s start with the Investopedia.com definition: “The S&P 500 Index (formerly Standard & Poor’s 500 Index) is a market-capitalization-weighted index of the 500 largest U.S. publicly traded companies by market value, The index is widely regarded as the best single gauge of large-cap U.S. equities.” To simplify it, the S&P 500 is a basket of 500 companies that are weighted based on the market caps of the companies included in the index. The companies included are all large-cap stocks. 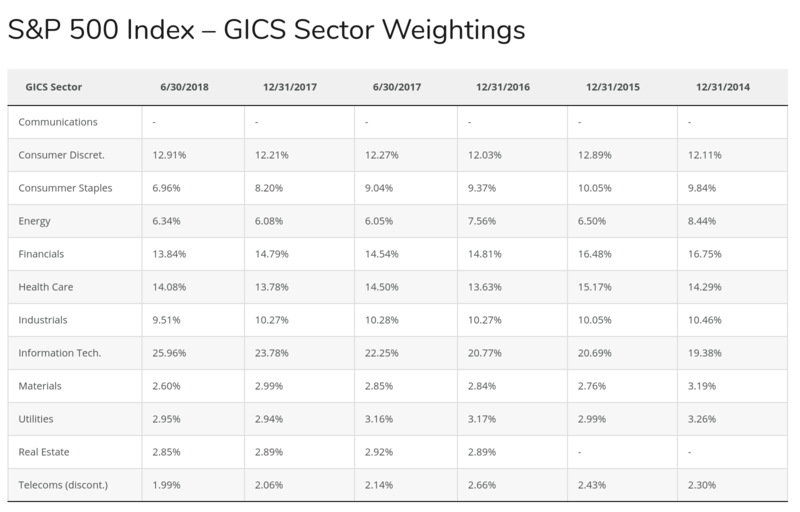 The index is considered a strong gauge of the broader market/economy due to the large volume of companies included in the index and diversification of industries among the index. Here is a diagram showing the weights of the S&P 500 as of 6/30/18 and some of the previous fiscal year ends. The source of the information from the table was Siblis Research. As you can see, this is a pretty diverse index. How was the S&P 500 Created? The S&P 500 was introduced in its current model/format in 1957. There were earlier versions of the index; however, this was the year the current model was established. Currently, the index is owned by the S&P Global Inc., which also owns the Dow Jones Industrial Average. For those of you that are history buffs, S&P Global was formally named. McGraw-Hill Financial, Inc. Yes, the same McGraw-Hill that publishes textbooks and educational content. How Does the S&P 500 select the companies included in the index and How is the Index weighted? As a beginning investor, this is a question I was always curious about. How on earth were the 500 companies of the index selected? On top of it, how is this list maintained and how are new companies selected when companies fall off the list? Surely with acquisitions, sudden decreases in value, or private buyouts, IPOs, etc., there must be a lot of companies either being removed or added to the S&P 500. It must be a U.S. company. The market cap must be $5.3 billion or more. The public float must consist of at least 50% of outstanding shares. It must have positive reported earnings in the most recent quarter, as well as over the four most recent quarters. The stock must have an active market and must trade for a reasonable share price. At first, for some reason, I thought that companies were only added or removed on an annual basis or as needed. However, an interesting thing I learned while performing research for this article is that the S&P 500 is constantly adding or removing companies from the index. So if a company suddenly meets the investment criteria or the company suddenly no longer meets the criteria, it will be evaluated and action will be taken. Lastly, how is the S&P 500 weighted? Each company does not simply represent 1/500th of the value of the S&P 500. Instead, the S&P 500 is weighted using each companies market cap. From there, the price of the overall index is calculated using each company’s weighted percent of market cap. To calculate each company’s market cap, simply multiply the company’s share price by the current shares outstanding. Can you invest in the S&P 500? While you cannot invest directly in the index, nearly every mutual fund or ETF family offers a low-cost fund that mirrors the S&P 500. By investing in this kind of mutual fund or ETF (learn about key differences between mutual funds and ETFs here), you are essentially investing in the S&P 500 as the fund family will do their best to resemble the holdings and weightings of the index. For the two of us, we invest in two Vanguard S&P 500 Index Funds (VINIX and VIIIX) in our 401k plans at Vanguard and Fidelity. The options have an extremely low expense ratio, pay a solid dividend (1.8%-2%ish), and provide us diversification and exposure to the broader market. This is definitely appreciated given the fact that we invest in so many individual dividend growth stocks as well (See our portfolios here to view our individual holdings). Hopefully this has provided you with some more background about one of the most heavily used terms in the investing community….the S&P 500. The index provides a great benchmark for the market, allows investors to achieve diversification if they choose to invest in an index fund, and will reward you with a solid dividend along the way. I enjoyed learning about the process for selecting companies to join the index while performing research for this article. I definitely learned a few new things tonight and hopefully you did as well! Do you have anything to add about the S&P 500? Have you invested in any index funds or ETFs? Or do you prefer to follow a different index? Are there any additional facts about the index that you would like to add that I did not include in the article? I know I didn’t catch them all! This entry was posted in Investing 101, Lessons and tagged Financial Education, Investing, market, S&P 500. Bookmark the permalink. Thanks P2035! I like that analogy and I was definitely shocked to learn about how frequently the index swaps companies in and out of the index. Another nice article in your educational series, well done guys! I have a decent size holding in two S&P 500 index funds–one is the Fidelity fund FXAIX and the other is Vanguard’s VFIAX–and both have performed well for me. I have also invested in Vanguard’s Total Stock Market Index that has these holdings as well. Thanks DivvyDad! Much appreciated. I have the VTSMX as well. All of my index funds have done well over the years and I love the easy investing/instant diversification that they bring.